"Oh happy day. Mail at last. Two from Jean and one from Mother. Sure was great to get them." Stationed on the island of Iwo Jima during World War II, Worth K. Baird had plenty to write about in his diary, from horrific scenes and scary moments to the boredom and monotony of day-to-day life as a soldier. But without fail, whether his day was eventful or unremarkable, he made sure to record whether or not he wrote to his wife. Mail is a central focus in Baird's diary, as I discovered upon finding it during my internship project cataloging items from the Armed Forces History Archive. This emphasis on mail surprised me at first, but after reading, I can understand why. When I'm away at school, a day rarely goes by in which I don't have some sort of contact with someone at home, be it a text or a phone call. I can't imagine being as isolated from friends and family as the soldiers of World War II were. So why was mail such a priority for the Army? For soldiers, letter-writing wasn't just a hobby—mail was often the only reminder a soldier had of life away from the battlefield. Baird lived for the letters from his beloved wife, saying, "Her letters do so much to pick me up. It's just like a new spark of life. She's a sweet wife!" He suffers and worries through extended periods of time without mail arrival: "No mail again. This mail situation is getting terrible. No one on the rock is getting mail. The weather has cleared too. Must be a big movement going on somewhere." His writing reflects how much his mood is affected by the mail or lack thereof. It was this idea that was highlighted in ad campaigns for V-Mail, urging women to "Be with him at every mail call." Baird's diary provides us with an interesting viewpoint on this censorship and its impact. Soldiers were officially forbidden from keeping diaries for similar security purposes, but many did so anyway. Writing likely helped these soldiers remember things and try to make sense of what they were experiencing. For those of us who get to read those diaries now, it also helps us learn so much more. 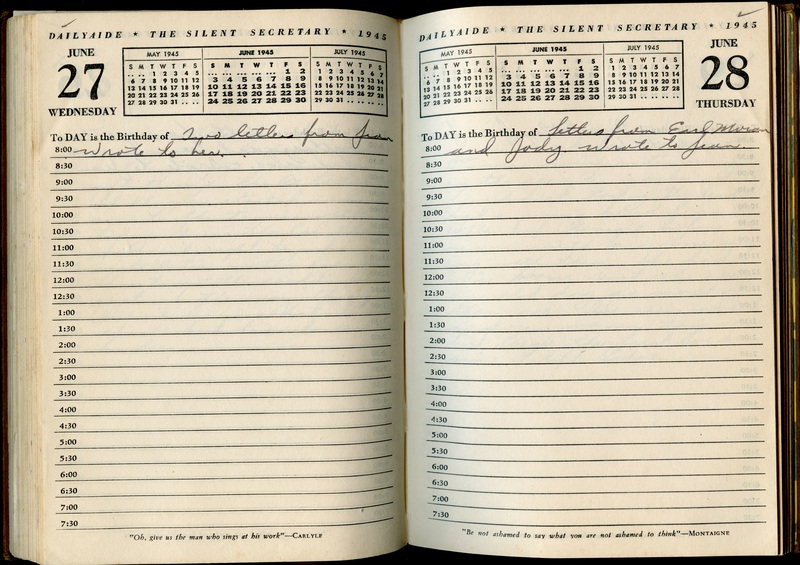 Baird writes in his diary daily, recounting in great detail events occurring during his time on Iwo Jima. Very little, however, can be described in letters to his wife, Jean. 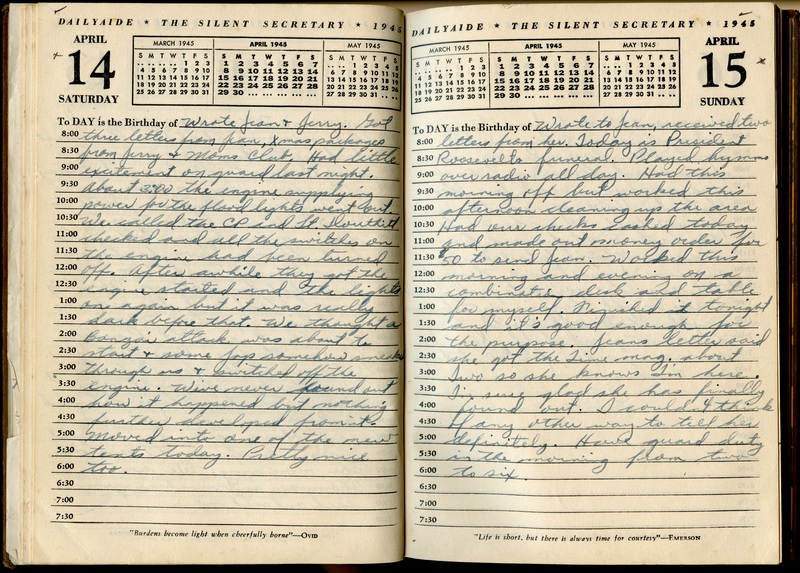 In one diary entry, he writes, "Awakened early this morning by a terrific explosion. Later we learned that it was an ammo dump just below Surabachi [sic]. We were down there later and ammo was still going off. Drums of gas in a dump nearby were burned and exploded. Don't know if any men were killed or not, but if they were near the blast they were lucky to get out alive because shrapnel had flown everywhere. And I write to Jean nearly every night that there is no news. Wish I could tell her all that happens." One of the most difficult elements of postal censorship during the war was that specific locations were classified until a certain point in time, at which they were released. So for many Americans at home, including Jean Baird, their husbands or fathers or sons were off performing dangerous tasks and they didn't even know where they were. Worth describes this issue in his diary in an entry soon after arriving on the island, saying "Got mail for first time. Letters from Jean, mother, Harry and Mrs. Hubble. Wrote letter to Jean. Couldn't say I'm on Iwo. Hope I can soon." An entire month later, he writes this entry, believing his wife may have figured out his location: "Jeans [sic] letter said she got the Time mag. about Iwo so she knows I'm here. I'm sure glad she has finally found out. I couldn't think of any other way to tell her definitely." For Baird, I'm sure that his diary was a great comfort while serving his country in a distant place during dangerous times, separated from those he loved. Now, however, it is able to serve a new purpose as a source for us to learn about what life was like for a soldier in the Pacific theater of World War II. It helps us to gain a new perspective and appreciation for the variety of challenges that our soldiers faced, apart from just physical ones. Personal letters and diaries can tell a unique story that helps us improve our greater understanding—and who knows, maybe the things we choose to write down will tell future generations about us! Heidi Butler completed a summer internship in the Division of Armed Forces History. She is a junior at Washington College and is an American Studies and Music major.